This quilt is a great BEGINNER or quick and easy quilt when you need one in a hurry. This quilt can be made as a throw size or as a large queen. We have a kit available for a throw in the combination pictured. 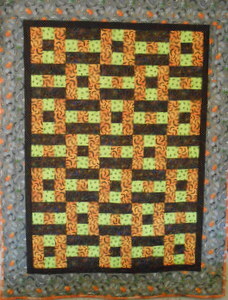 This quilt can also be made with a wide variety of combinations with our wide selections of fabric. Class is a 4 week session to make the quilt top. Call or email for more information on our classes.